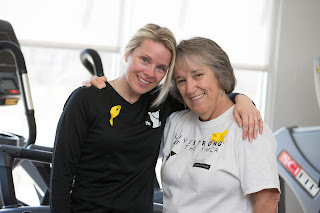 Since 2010, The Hockomock Area YMCA has been facilitating the LIVESTRONG at the YMCA program and they are pleased to announce new classes for 2019. Cancer survivors are encouraged to visit www.hockymca.org/new-livestrong-classes or contact Jackie Robison, Program Coordinator at 508-772-1310 or JackieR@hockymca.org for more information and to enroll. In 2010, the Hockomock Area YMCA was one of the first ten YMCAs in the country to launch this life changing initiative, partnering with the LIVESTRONG Foundation to help cancer survivors begin the journey toward recovery with the LIVESTRONG at the YMCA program. On average, 120 participants graduate from the program annually at the Hockomock Area YMCA. A recent survey at the Hockomock Area YMCA found that ninety-nine percent of LIVESTRONG at the YMCA participants said that the atmosphere of the Y supports them in their pursuit of health and well-being. Part of the Hockomock Y’s commitment to strengthening community through healthy living, the program offers adults affected by cancer a safe, supportive environment to participate in physical and social activities focused on strengthening the whole person. The Hockomock Area YMCA is enrolling now for upcoming LIVESTRONG at the YMCA sessions at their branches in Foxboro, Franklin, and North Attleboro.